"My interest in ultrasound began over a decade ago when, as a registrar training in Edinburgh, I visited Australia to work at the Royal North Shore Hospital in Sydney. At that time, we were not using ultrasound in Edinburgh; emergency departments (EDs) were only just starting to use the technique and there was no college-approved training route. The situation was different in Sydney, where emergency medicine and critical care clinicians were using ultrasound for FAST scanning in trauma cases and for vascular access, and I completed a level 1 training course while I was there. After I returned to the UK, I worked with radiologists from time to time to maintain my ultrasound skills, and also completed another course to refresh my knowledge. When I became a consultant in 2007, I took on the role of ultrasound lead and, at the same time, the emergency department invested in a dedicated SonoSite system, complementing those already used in radiology and critical care. The system’s robustness is ideal for the department, and radiologists and critical care physicians needing to scan patients in the ED were already familiar with the system, which was another advantage. Today, we have around 60 clinicians fully trained in level 1 ultrasound, with another 20 in training. The number of scans performed in a typical month has risen from 10 to in the region of 80 to 100, and the range of applications has expanded to include FAST, vascular access, nerve blocks, foreign body localisation, joint aspiration, scanning for abdominal aortic aneurysms and, in particular, cardiac echo. We see about 200 cases of cardiac arrest a year and, as everyone in the department is trained in cardiac ultrasound, almost all of these patients will be scanned. This approach has the potential to benefit the management of cardiac arrest. Currently, all patients without a pulse but with an electrical rhythm receive the same treatment, but we know that the prognosis for patients with a beating heart is far better than for someone in cardiac standstill. An ultrasound scan can show whether or not a patient remains in cardiac standstill following a period of intensive resuscitation, sometimes a pathology – such as cardiac tamponade or ventricular fibrillation – that was not visible on the ECG is detected, and it can also help guide the most appropriate course of action, for example, unblocking a coronary artery in the cath lab, aggressive treatment of alternative causes of cardiac arrest, or possibly ECMO. In addition to my clinical work, I co-founded the Emergency Medicine Research Group Edinburgh (EMERGE), which worked with the Resuscitation Rapid Response Unit (3RU) to explore the potential use of point-of-care ultrasound for pre-hospital assessment of cardiac arrest patients in the Paramedic Ultrasound in Cardiac Arrest (PUCA) study*. The 3RU team is a group of paramedics specially trained in life support who have undergone further training in advanced cardiac arrest management, and are preferentially tasked to these call-outs. During the PUCA study – funded by the Resuscitation Council (UK) and Chest, Heart and Stroke Scotland – the 3RU team trained in echocardiography, learning how to establish the presence or absence of cardiac movement and the quality of the contractions, as well as looking for any abnormal rhythms and fluid around the heart. Once trained, the paramedics were monitored as they used ultrasound to assess cases of cardiac arrest, and the scans were recorded and reviewed until they had developed sufficient expertise to pass a practical test. From that point onwards, they scanned patients independently, discussing the management plan in real time with the emergency clinicians back in the hospital to help determine the most appropriate treatment. With the study complete, we have devised an algorithm to incorporate point-of-care ultrasound into pre-hospital management of cardiac arrest, and hope to establish it as the standard of care. While we wait for approval from the Scottish Ambulance Service, the paramedics continue to attend training sessions, practising their ultrasound skills to ensure they keep up to date. Ultimately, the adoption of pre-hospital ultrasound assessment, complementing care in the ED, will help to streamline the management of cardiac arrest patients. Ready to Learn More About Point-of-Care Ultrasound for Cardiology? Every day, more cardiologists are making use of high-quality cardiac imaging with ultrasound at the point-of-care, enhancing their ability to diagnose and treat cardiac pathologies at the point-of-care without exposing patients to the radiation of X-ray or CAT scane procedures. 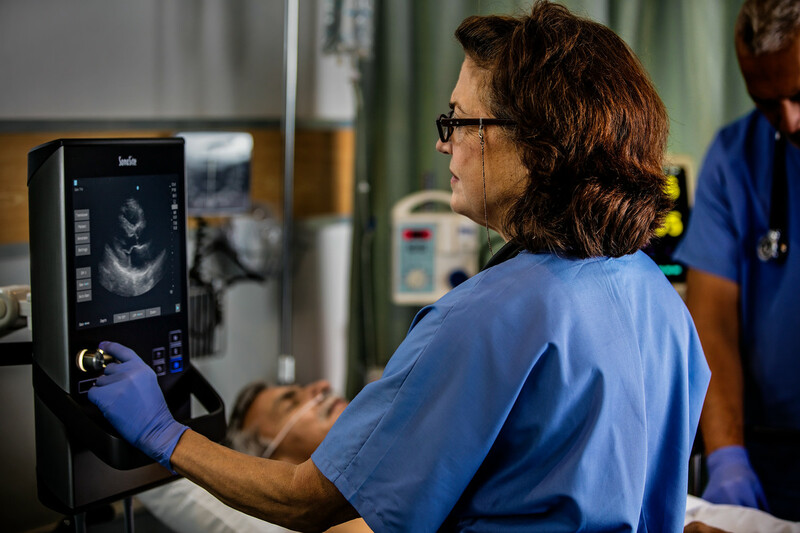 Learn more about cardiac imaging with SonoSite ultrasound.